For other less dateable art, one problem should be obvious: How can ‘primitive’ art look so good and colourful after 40,000 years of exposure when even more modern art needs retouching within a century or two? Some have suggested it was tribal practice to regularly touch up the paintings in order to keep the images visible. 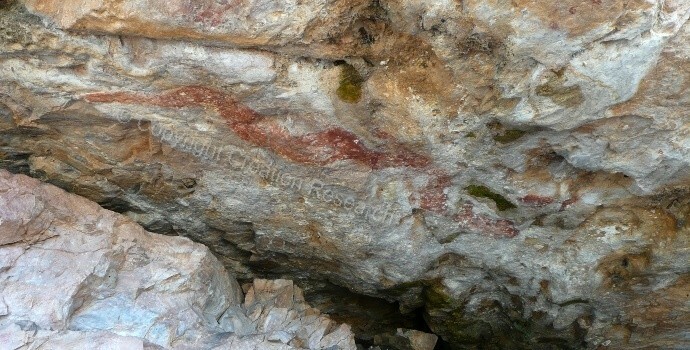 We have personal experience of this in the Three Brothers region cave paintings of Northern NSW. But then one must ask; ‘Was this process maintained consistently, unbroken for up to 40,000 years as tribes died out moved on etc?’ Seems incredible. For that reason alone many doubt the antiquity of such art. Modern paint companies have spent enormous amounts of money on high-level chemical research to formulate paints that will last through multiple seasons of intense outdoor weather extremes of heat and cold. Most home-owners know it is difficult to get house paint inside or out to last more than 10 years without deteriorating significantly. If aborigines used only simple combinations of natural elements which resulted in paint that lasted outdoors (and indoors) for even a hundred years, then paint companies would be clamoring after the secret. Paint formulas with such longevity would be nearly priceless. But even after years of the best applied scientific research we have no such paint formulas – and still we are asked to believe that ‘primitive’ rock art has survived in the midst of the most hostile Aussie climatic conditions for 40,000 years! Is there a Biblical perspective on dating Aboriginal Rock art? The Bible is clear in Acts 17:26: God the creator ‘made from one man every nation of mankind to live on all the face of the earth…’. All ancient and present day civilizations arose after Noah’s Flood and after the Babel event (Genesis 11) when mankind spread out across the earth about 4,500 years ago. Some people groups carried with them great technical knowledge and built empires – as evidenced by the ancient Egyptians and South American Incas. Others, such as the Australian Aborigines, carried on a more nomadic lifestyle, building no cities and having no farms or animal herds. Their art-forms were relatively low-tech when compared to the levels of sophistication in art and architecture that was achieved by cultures such as those in Egypt, the Middle-East, and the Southern Americas. Australian Aboriginals have never been ‘primitives’ ascending some imaginary evolutionary tree, but rather descending from an earlier high-tech mid-eastern culture. They descended originally from the Ark-building Noah and from there via the city-builders at Babel who had immense engineering knowledge, thence down through India and, finally, to Australia. Over this time and more so after they arrived in Australia, they lost whatever high-level engineering, building, and technical knowledge they once had. The presence of many types of stone tools shaped in the same way as European Metal tools found in the region where NSW aboriginals state their ancestral 3 brothers first landed, are a dead giveaway. To understand this process more clearly, imagine a ship being wrecked on an unknown island. It remains undiscovered for centuries. The people survive and live on, and form various groups which separate out across the island. Due to geographical boundaries the various groups have either much, or little, or even no contact between each other. Some of the people aboard were originally doctors, civil engineers, writers, cooks, musicians, and farmers. The groups, for example, that had people who were experienced in building things flourished and were able to pass on that knowledge to descendents. Their ‘culture’ manifested itself with such things as sophisticated buildings and monuments. Others knew how to farm the land and develop crops and animal herds. Some of these even interacted with each other, sharing experience and knowledge which benefited both groups. Other groups began with no one among them with previous experience in building or farming. If they became totally isolated and cut-off from any outside interaction, they survived as hunter gathers, which left them no time for anything but surviving. No time for art except in its basic form. No technology except to eat and keep warm, so they became less and less sophisticated as time and generations passed. Enter so called ‘primitive man’. When they are finally discovered, centuries later, one might find groups likened to the Aborigines whose ancestry was the same as the others, but who had lost all the technical knowledge their group originally once had. They are not less intelligent than the others who have built cities or have developed more advanced social orders. However, they have had no one within their surviving group with the advanced knowledge of building or art (for example) to pass on to the coming generations. Once discovered, one might conclude that the less sophisticated group never had the knowledge and were always ‘primitive’. Another researcher might suggest that all these peoples came from only one group who all originally possessed this knowledge and lost it. The presence of boomerangs in King Tut’s tomb in Egypt is evidence consistent with this proposal. But since God the Creator was there, you have an eyewitness perspective that Aborigines could not have been in Australia for more than around 3000 years maximum. A more realistic figure, particularly based on how few there were in Australia when Europeans arrived, is closer to perhaps 1-2000 years. Which also means much of the Aboriginal rock art visible today is probably around several hundred years old with some which has been retouched regularly up to as much as 1-2000 years old. Archaeologist Ben Gunn, a founding member of the Australian Rock Art Research Association, was documenting the Niwarla Gabarnmung site in southwest Arnhem Land in Australia’s Northern Territory. It is a region that has thousands of aboriginal rock art sites. The alternative Biblical view is that the vast time periods proposed by evolutionary historians don’t exist and that these large birds were seen and illustrated by Aborigines probably very much within the last 1000 years. Evolutionary ideas gave rise to a form of racism which in its earlier days taught that people groups such as the Aborigines were less advanced than Europeans on the evolutionary time-scale, and somehow closer to man’s less intelligent allegedly ape-like ancestors. As a result Aborigines were considered as primitive savages like others of the world’s ‘indigenous peoples,’ and some were rounded up, captured, and studied for research. Today, political correctness rather than the clear implications of evolutionists’ beliefs has caused many to distance themselves from their inherently racist evolutionary philosophy. The Bible has always maintained that mankind is one kind – so we are all related via Adam and via Noah regardless of our immediate ancestry or skin color. Therefore, like all human beings, Aboriginals have equal dignity and value with every other human being simply because they are descended from the first man who was made in the image of his Creator and not because of any alleged racial longevity. And the Bible has also maintained the politically incorrect position that man’s problem – regardless of whether you are black white, or brindle – is a problem called sin, inherited from the first man Adam. Therefore each of us has a real eternal need for the only savior Jesus Christ, rather than any temporary political solution. Carbon 14 dating proves things are too old for Genesis to be true. What’s your argument against it? Answer here. Steve Cardno studied art at Griffith University’s Queensland College of Art and has a keen interest in understanding history and art from a Biblical perspective. He is Australia’s longest serving creation artist having worked with Ken Ham and John Mackay since the 1970’s.